Holistic Management Workshop: Day 1 | Planet-TECH Associates: Trends. Innovations. Opportunities. You probably think of small time dairy farming as an idyllic 18th century occupation with Amish practitioners far removed from contemporary science, politics, and economics. Well, in certain ways, in may be idyllic, but it here at Hendricks Farm in Telford, Pennsylvania, this family run business is no laggard. They are setting a precedent for how to run a farm that is ecologically restorative, profitable, and fun to be around. Without the use of pesticides, hormones, or grain feed, they are raising healthy cows while growing grass and replenishing the soils that were devestated by the the prior owners. They are running more cattle than conventional practice would say is possible and they're doing it at less the cost. The cattle are healthy and they produce a premium product that people want. In addition, of course, by replenishing the soils, they are sequestering carbon, improving water tables, and increasing property values. By managing their grazing practice for the health of the land, and not just the production of flesh of milk. By understanding that viability means the soil can't get depleted. By understand that grasslands and grazing animals co-evolved, and when livestock are managed in a way that replicates natural herd behavior, high density and short duration, the soil improves. And in short, by using the Holistic Management decision making process, that recognizes ecological and social factors, as well as financial considerations in farm and land management. Mycellial networks. Fungi. Grassland health. Going against conventional wisdom. High density, pulsed or "mob" grazing. Holistic planning. Holistic goals. Soil health. Paddocs. Grass fed beef. Organic farming. Seven generations. Case studies. It's possible to feed the world without destroying the Earth. We just need to make better decisions. We need to manage for soil health, and we need to understand that animals are part of the equation. 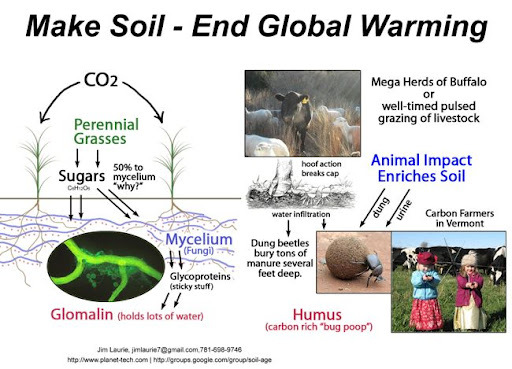 The soil needs animal impact, but it needs it in a way that is consistent with herd behavior from which it co-evolved. European farming methods have destroyed soils, and high-tech methods are not helping, but there are alternatives, and here in Telford, we're seeing proof. There is hope for the future, and it gives milk.